The General Assembly’s 2013 repeal of the teacher tenure law amounted to an unconstitutional taking of contract and property rights as to those teachers who’d already attained that status, according to a Court of Appeals opinion released this morning. [W]e cannot escape the conclusion that for the last four decades, the career status protections provided by section 115C- 325, the very title of which—“Principal and Teacher Employment Contracts”— purports to govern teachers’ employment contracts, have been a fundamental part of the bargain that Plaintiffs and thousands of other teachers across this State accepted when they decided to defer the pursuit of potentially more lucrative professions, as well as the opportunity to work in states that offer better financial compensation to members of their own profession, in order to accept employment in our public schools. The ruling by the three-judge panel affirms Superior Court Judge Robert H. Hobgood’s decision handed down a little over a year ago. Under North Carolina’s “Career Status Law,” teachers in their first four years were deemed “probationary” and employed year-to-year under annual contracts. At the end of the four-year period, they became eligible for career status, giving them rights to continuing contracts and due process protections from arbitrary or unjustified dismissals. In summer 2013, lawmakers enacted a repeal of that law in an effort to rid the state of tenure by 2018, saying that it enabled bad teachers to stay in the system. They eliminated tenure for teachers who had not reached career status by August 2013 and revoked career status for all teachers by July 2018. As an enticement for already-tenured teachers to act sooner, lawmakers also required local school boards to offer 25 percent of them temporary 4-year contracts with annual raises of $500 in exchange for giving up their tenure rights early. In May 2014, Judge Hobgood ruled that the revoking of tenure for teachers who’d already reached career status was unconstitutional, as was the “25 percent” plan, which Hobgood said included no standards to guide school districts and served no public purpose. As to teachers who had not yet achieved career status, though, Hobgood found that they had no protectable contract rights and thus could not challenge the repeal. 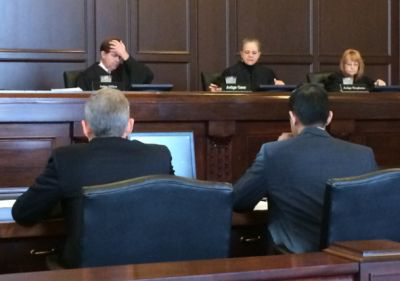 Two judges on the panel, Stephens and Martha Geer, largely agreed with Hobgood’s ruling. But Court of Appeals Judge Chris Dillon issued a separate opinion in which he agreed only with the lower court’s finding that tenured teachers had property rights warranting a hearing in the event they were dismissed (something the repeal did not allow). Well Thank GOD that they finally got smart enough to realize what was right all the time. When is North Carolina going to wakeup and start honoring our TEACHERS. We are loosing teachers everyday to other states as well as other professions because of the stupidness of our governing body. Wakeup people and think about how important ourTEACHERS are to N.C.’s future. Parents please start supporting Your Child’s TEACHERS before it is too late. Remember Teachers are helping U raise Your children and need Your support to help them help You???? Well at least some folks in NC still believe in the law and doing what is right, thanks to Judge Stevens.